It’s likely that you have heard about the cloud and may already use its services in various aspects of your life. But did you know it can improve your surveillance system and storage? Cloud storage allows you to save your video footage remotely and access it online. You may use cloud storage in lieu of, or in addition to, saving your files locally, whether on an NVR or computer hard drive. 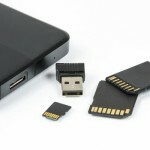 By utilizing cloud storage, you gain access to numerous benefits. Here are some of the biggest and best benefits of cloud storage. You get more storage space by using the cloud. This means prolonged retention of videos which can be helpful for evidence purposes. If you use cloud storage in addition to your NVR or computer hard drive, you allot yourself even more potential storage space. There are NVRs that are specifically designed to work with cloud storage, which contain a small hard drive that stores videos locally before uploading them to the cloud. Just remember that the uploading process can slow down your network. If possible, NVRs with a cloud service that allows you to upload videos on a schedule is ideal. This will enable you to schedule uploading during off-peak hours, such as nights, early mornings, or weekends, to offset the impact on your network. Added bonus – since your data files are not stored locally, in the event that your equipment is damaged or stolen, your video footage remains safe. Because your cloud storage solution is managed offsite, you won’t have to rely on on-site technicians and appointments to resolve issues. Troubleshooting and maintenance may be performed as needed, minimizing any downtime and allowing for better customer service and support overall. You may check in on your surveillance system from anywhere, anytime. While other systems may allow remote access, you may have to deal with speed and buffering issues. With cloud video surveillance, built-in buffers and systems keep video playback and streaming quick and clear. Cloud solutions allow for regular updates as needed – you don’t have to do a thing! This ensures that your system safe from potential vulnerabilities and operating at its best. As your on-premise equipment requirement is greatly diminished, upgrading and scaling your system is made easier. You can forgo the extensive installation process and expand your system as necessary as your business grows. Also, because most of the equipment is off-site, you can save precious office space. By now you should know that cloud solutions are great at self-monitoring and resolving issues with minimal user intervention. With that said, these systems are constantly monitored for stability and have redundant systems that ensure security cameras are always active and recording. And in the case of natural disasters, which may destroy your on-site equipment, your data will be fine. 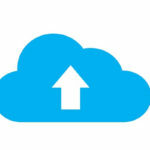 Save money by choosing cloud solutions, which usually offer a low monthly fee for their services. In the long run, this is much more cost-effective than purchasing on-premise equipment, which requires installation and routine maintenance at additional costs. Do you utilize cloud surveillance solutions? Share the ups and downs of your surveillance system with us on Facebook, Google+, Twitter, LinkedIn, and Pinterest. Security cameras play a major role in home security. Aside from deadbolt locks and alarms, security cameras can provide video footage of incidents and alert you as needed. Of course, the quality of the security camera and surveillance footage is important, and the proper video storage has a direct impact on this. 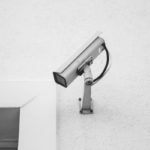 When it comes to video surveillance storage, there are basically two options – local and cloud. Evaluating their differences can help you narrow down your security system options. 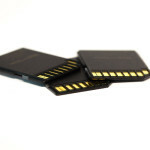 Local video storage saves your footage locally – usually via microSD cards. Security cameras that offer local storage have built-in microSD slots that can typically handle anywhere from 16GB to 128GB. These cards may be included in your purchase or you may have to purchase them separately. Once the microSD card is properly inserted in the security camera, you may then set your preferences in the accompanying mobile app for video storage. You may choose event-based recording, which only saves clips when motion or sound is detected, or continuous recording, which records everything around the clock. When the card is full, you may continue recording (by overwriting the previous footage), or stop recording and manage footage manually. You can usually view saved clips in the app, but you may also removed the microSD card and stick it into a card reader or card adapter if you would like to save videos to your computer. Those who are concerned about privacy often prefer this option, as you are in charge of managing your videos. In addition, your video surveillance footage is easily accessible without having to pay a monthly fee (which is common with cloud storage). 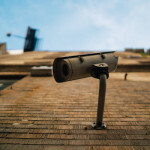 Much like smartphones store photos and other data on “the cloud,” security companies seem to be following suit with video surveillance footage. Rather than purchasing additional parts and manually managing your videos, you can opt for cloud storage. Your event-based or continuous recordings are sent off to remote servers and you are charged a monthly fee based on the service provider and the type and amount of surveillance footage you store. 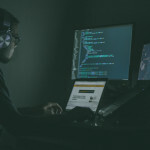 These subscription-based cloud storage services are generally more convenient than dealing with microSD cards, however, you do not have control over these remote servers. Thus, outages can cause major issues, such as delays in accessing your saved videos. And for the privacy-conscious, you might always wonder who has access to your footage. It really just comes down to your own needs and preference. Local storage gives you more control while cloud storage provides more convenience. If you really can’t decide on one or the other, there are hybrid options on the market that offer a mix of both. Along with other factors, video surveillance storage is important when deciding on a security camera system. If you need any help choosing a security camera system, or simply want to view some cost-effective quality CCTV surveillance cameras and systems, visit SecurityCamExpert.com or call 888-203-6294. Our representatives are happy to answer questions and provide you with a free quote.